Warren Buffet’s Berkshire Hathway is insuring Quicken Loans’ prize of $1 Billion dollars to someone who picks a perfect March Madness bracket and 20 prizes of $100,000 to the closet brackets. The rules won’t be enumerated until March 3, but so far they haven’t outlawed Garciaparra-ing by pulling a Nandor. If you want people to sit up and notice Perl, winning this contest with a Perl program will get you all the fame you want. You’ll be any job you want, but with $500 million (the present day value single payout), you won’t have to take it. For this Learning Perl challenge, you have to create a your bracket with Perl. 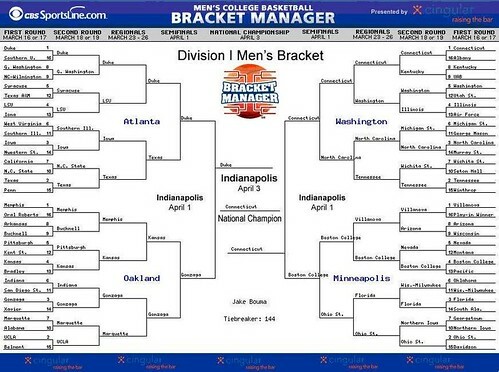 But, not only your bracket, but all other possible brackets the reduce 68 possible teams to one champion. How quickly can you make 100,000 brackets? How much disk space would you require? Although I typically limit these challenges to the material in Learning Perl, the bit vector chapter in Mastering Perl might be useful. If you’re really motivated, you might taking seeding and ranking to make the more probable brackets first. How many do you think you could submit before they cut you off? They haven’t announced how to enter, so that might be a later challenge. Remember in posting your programs, you’re giving other people the opportunity to submit your perfect bracket.